Knitted dungarees for babies free knitting pattern. 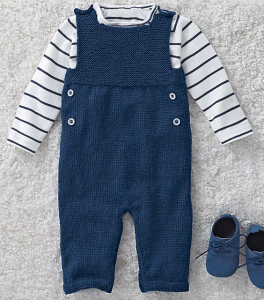 These quick-knit dungarees for babies feature a garter stitch bib and stocking stitch legs, with buttoned shoulders and press fasteners on the inside legs for easy dressing. Very nice patterns. Problem is where to find the free pattern. Can you help me with that? Click on Free Pattern under the image.